The first two enclosures are done! 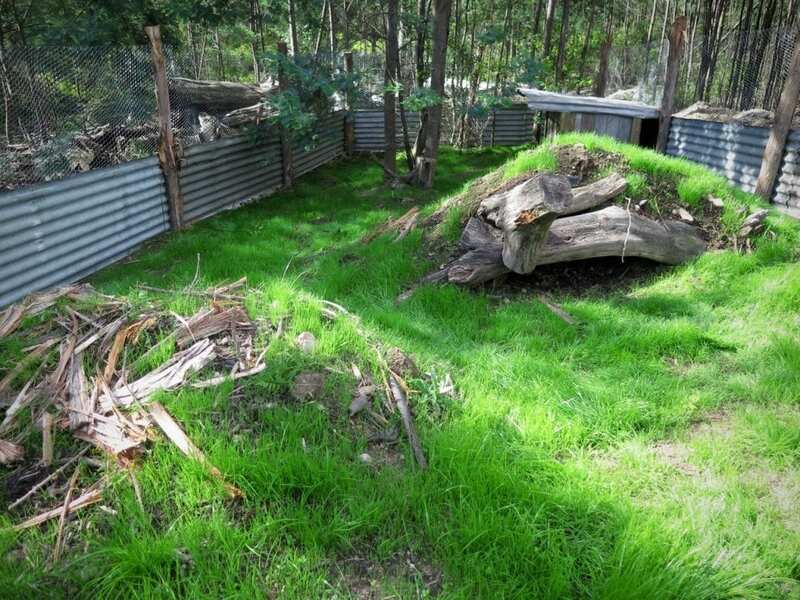 We started with the new Wallaby enclosure in October. 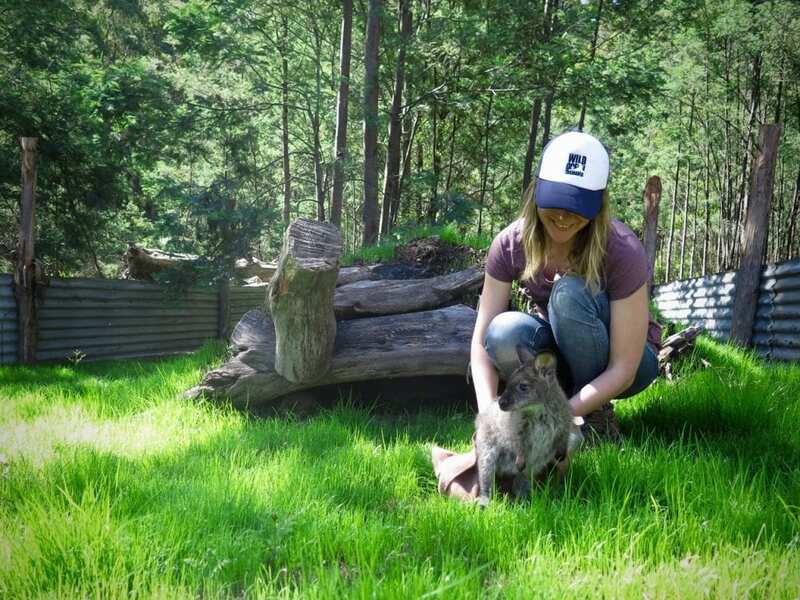 The old one has served twenty Pademelons and Bennett’s Wallabies over the last 5 years and needed to be replaced. 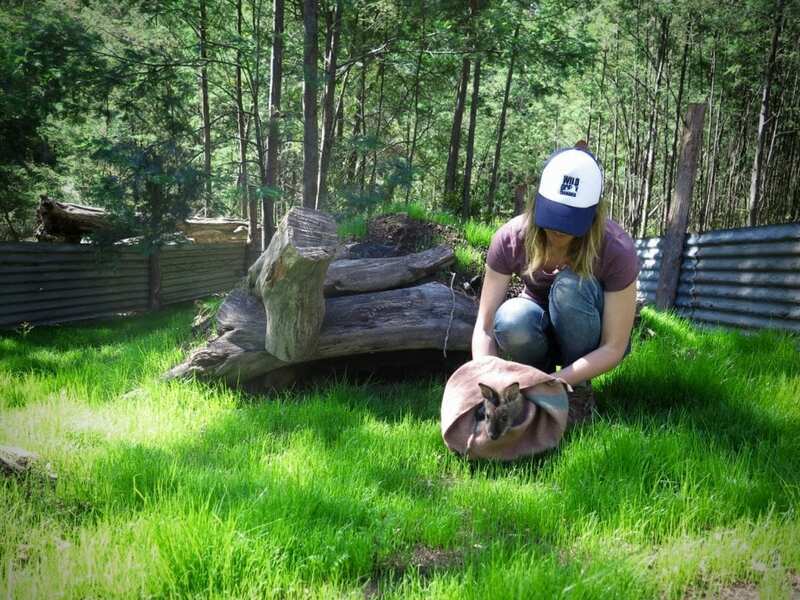 We are using mainly recycled materials that are also aesthetic and functional for the purpose of keeping the orphaned wildlife safe. 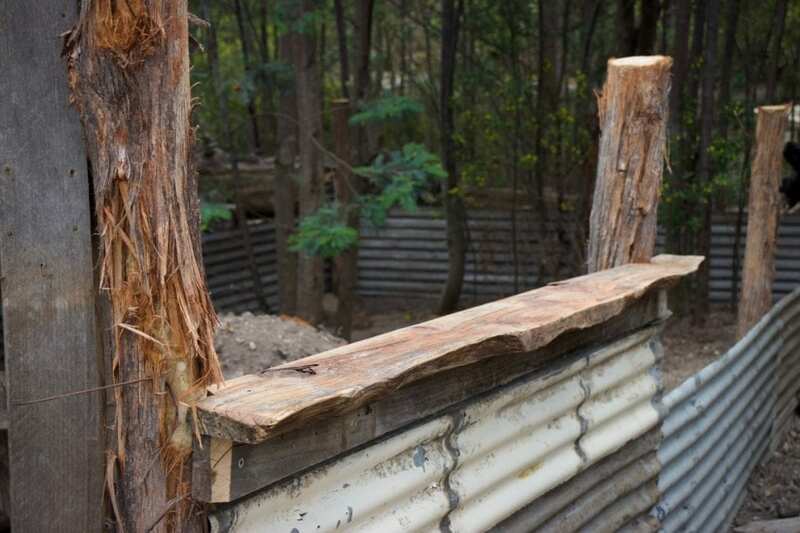 Plan for the new enclosure was to use mainly recycled, strong and long lasting materials. Of course we wanted it to be aesthetically appealing and safe for the animals as well. We chose an area on the property that was partly open and sunny, but also had enough trees and foliage to provide some natural shelter and shade for the wildlife. New grass shoots coming through. A week of light precipitation helped the grass grow quickly. Additionally to those natural features, we mounted up some large branches and soil to create a spot for the animals to hide under cover. We also managed to sow some grass just before we had a week of light precipitation (it has been super dry for months!! ), which was perfect timing and really helped the grass grow quickly. Beautiful lush grass for the animals to feed on. Although the enclosure was not quite finished yet, we were ready for a test run. 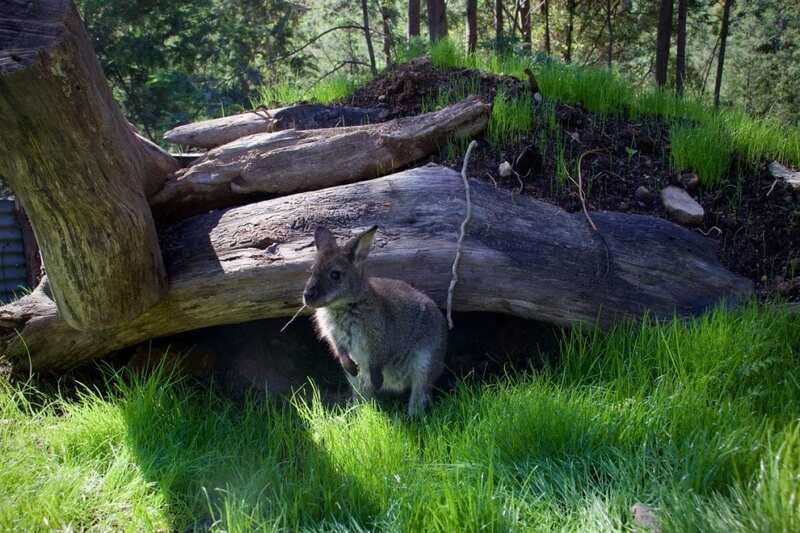 Our oldest Bennett’s Wallaby Joey Barney got introduced to the new outside enclosure first and seemed to love it! Not quite finished yet, but ready for a test run. First time in the new wildlife enclosure – Getting used to the new environment. Barney enjoyed to have a good hop around and scoped out the new shelter straight away. 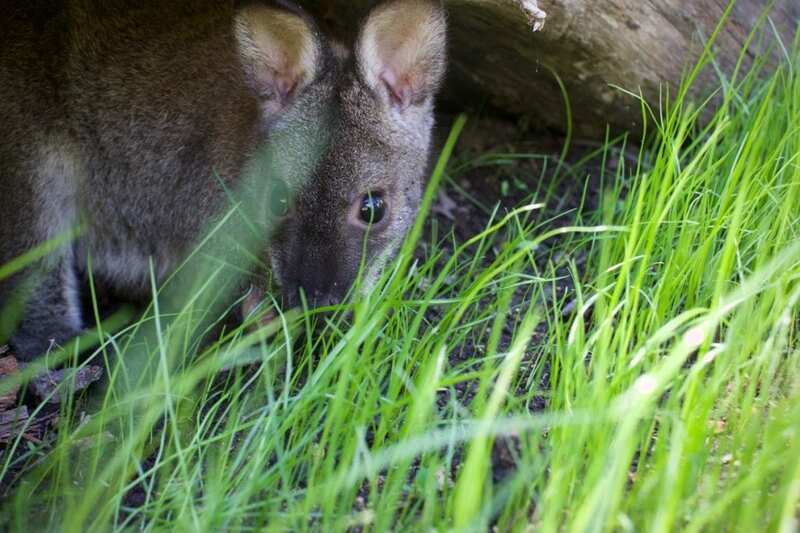 Wallabies naturally seek a place under cover to be safe from predators like birds of prey. Barney discovering the new shelter. 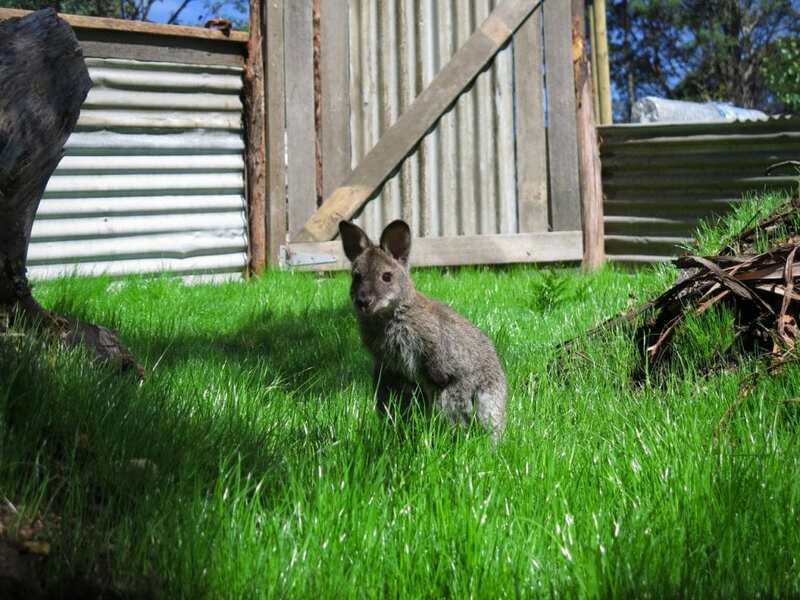 Wallaby Joey Barney has accepted the new shelter. Barney looks very happy about his new home. 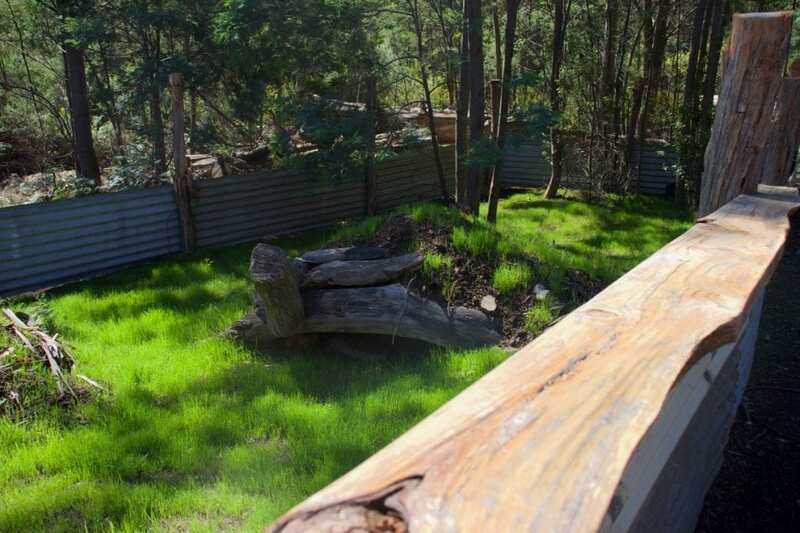 The newly finished wildlife enclosure. 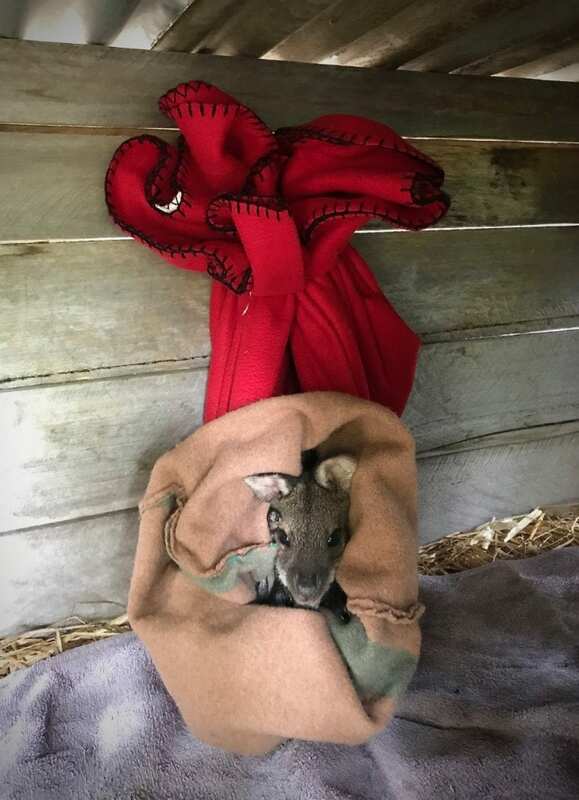 Because we currently have three Bennett’s Wallabies in care, we also needed a relatively large shelter to hang up their pouches under cover and to provide a warm area for them to rest on windy and rainy days. 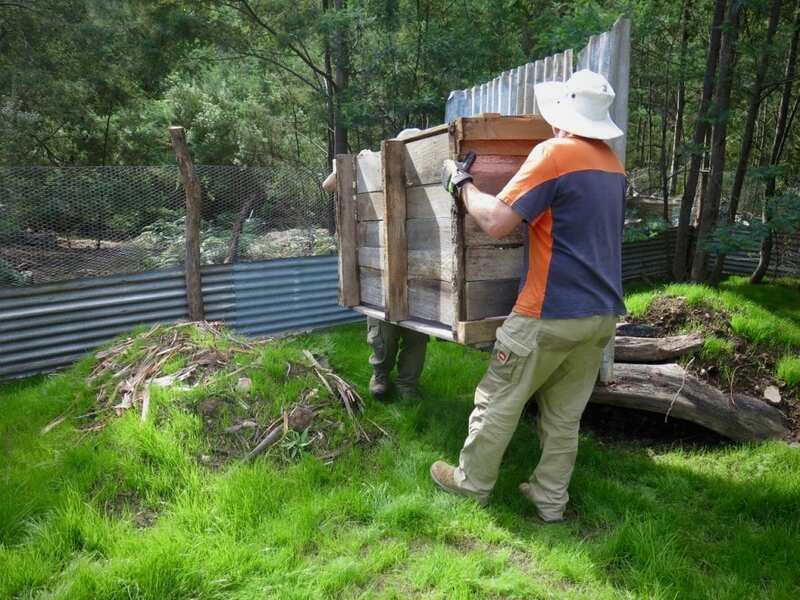 Carrying the newly built shelter into the enclosure. As usual, Barney was more than happy to try the new pouch set-up for us. Looking very comfortable! 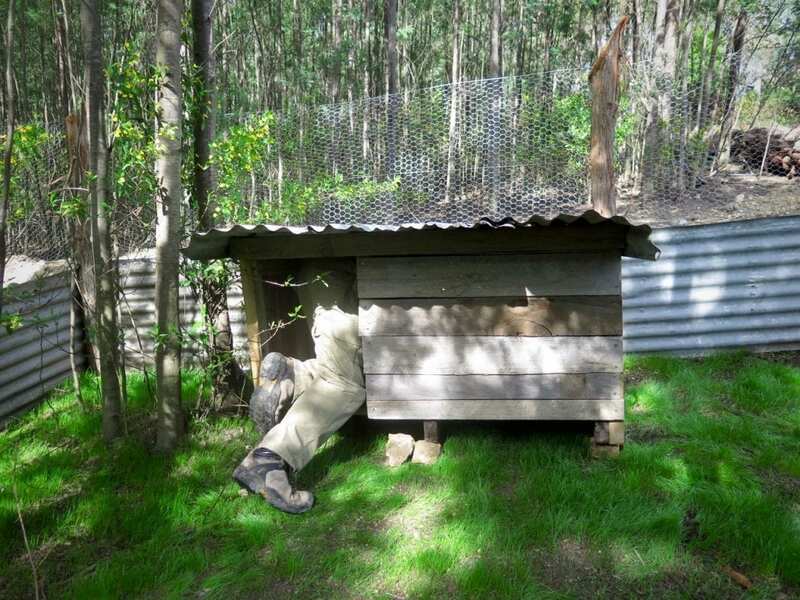 Hanging pouch set-up in Wallaby shelter. Womby came into care when she was about 2.8kg and has been growing and putting on weight nicely. Time for her to move into a very sheltered outside area, that should serve her for the next couple of months. 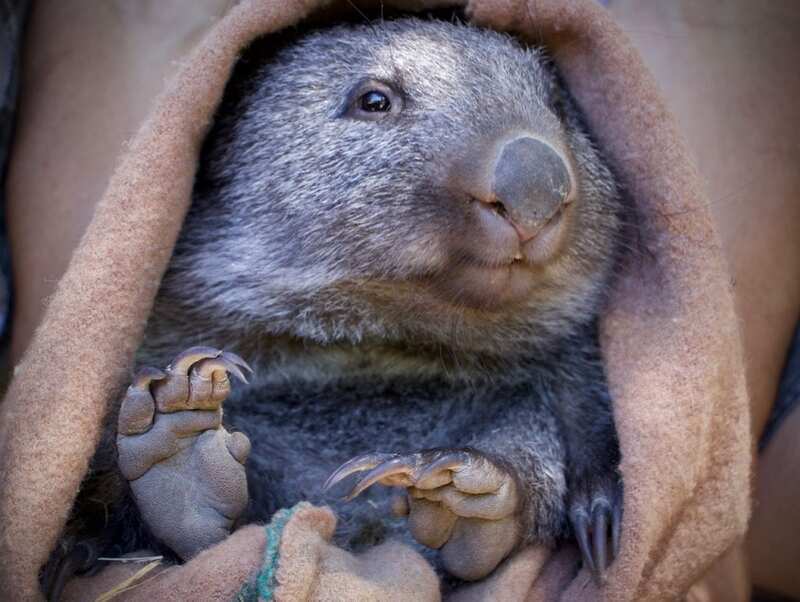 Wombats loooove tunnels, burrows and digging up soil. All these features were needed for the transitional enclosure. Plus it had to be very sheltered from wind and rain, because Womby is still quite small, weighing 5.5kg now, and she likes it nice and cosy. 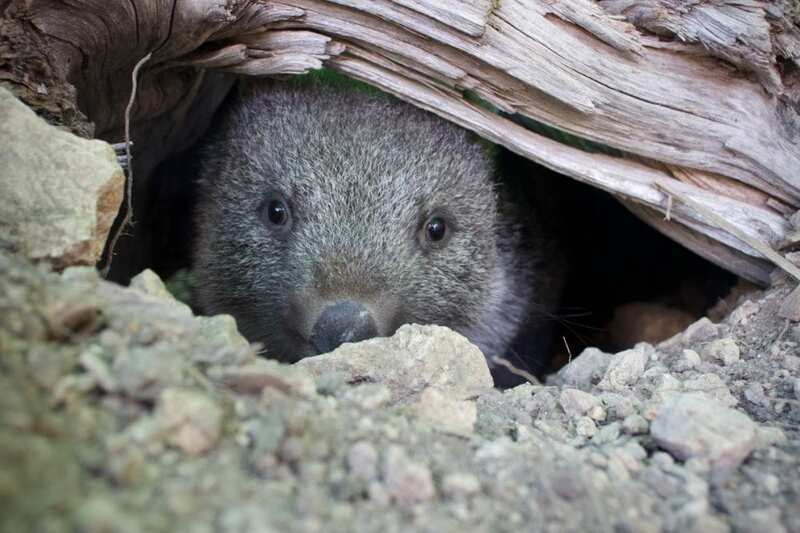 Tunnel and burrow system for the Wombat. The photo above shows the tunnel and burrow system we created for her. 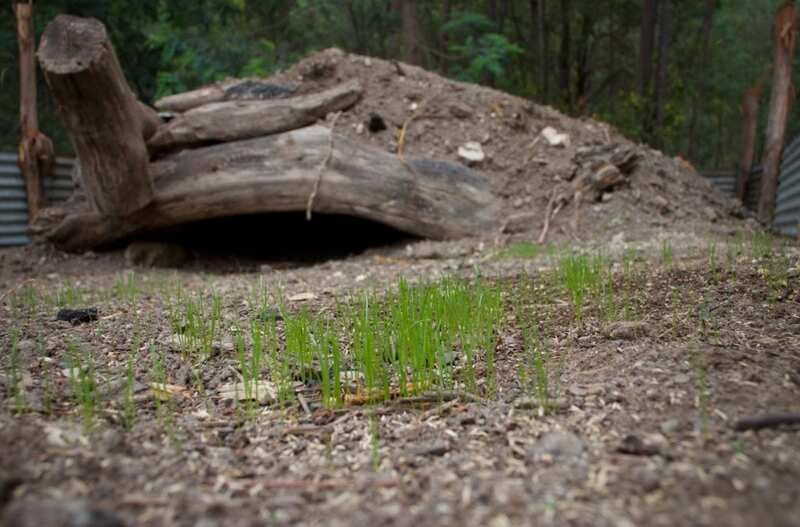 We used soil, rocks a log and tree stumps to make up a natural looking entrance to the tunnel. 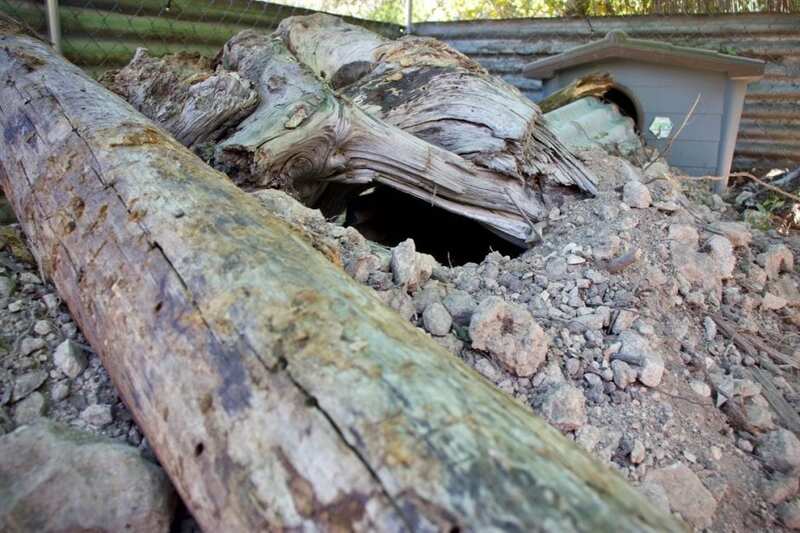 The whole enclosure is filled in with soft dirt and rocks, so Womby can dig freely. 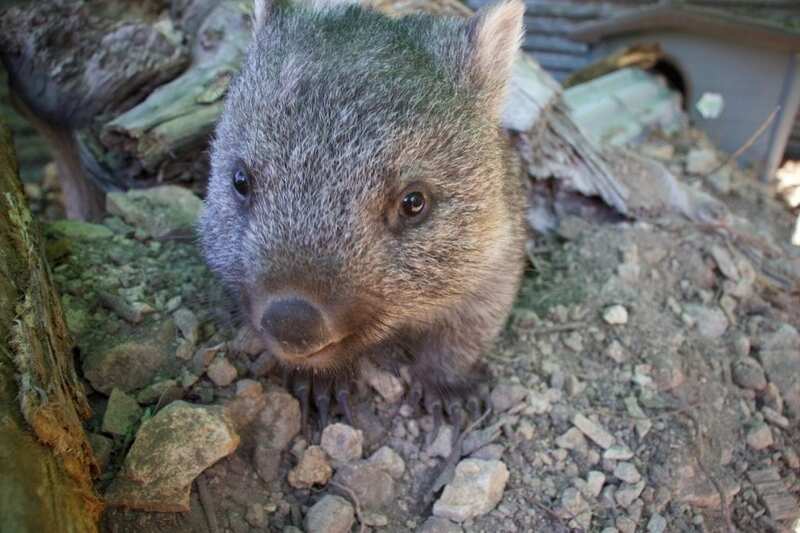 Digging is an essential skill for a Wombat joey to gain before it can be released. 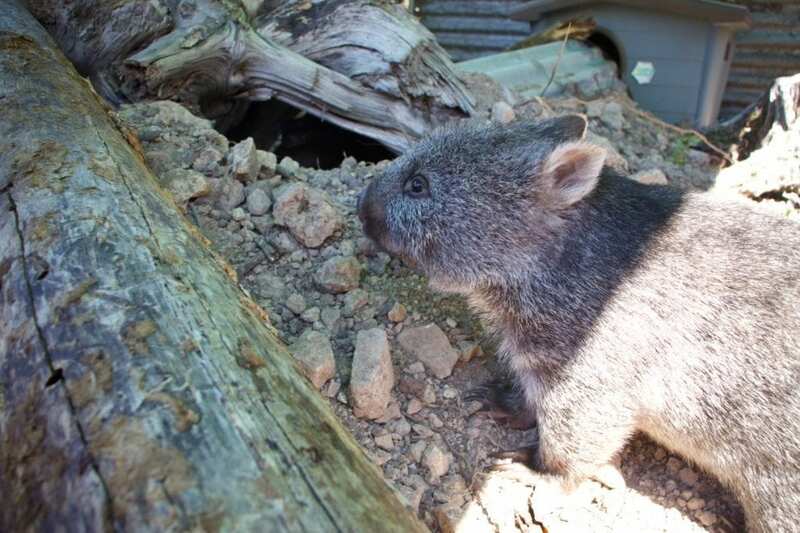 Time for Womby to explore the new enclosure. Womby getting introduced to the burrow. A big THANK YOU to all the lovely people who have joined our tours in the past. You help fund our wildlife rescue and rehabilitation work, as part of the tour rate goes towards our wildlife orphans to pay for their milk formula, medication, building materials etc. One of the largest birds in the World! 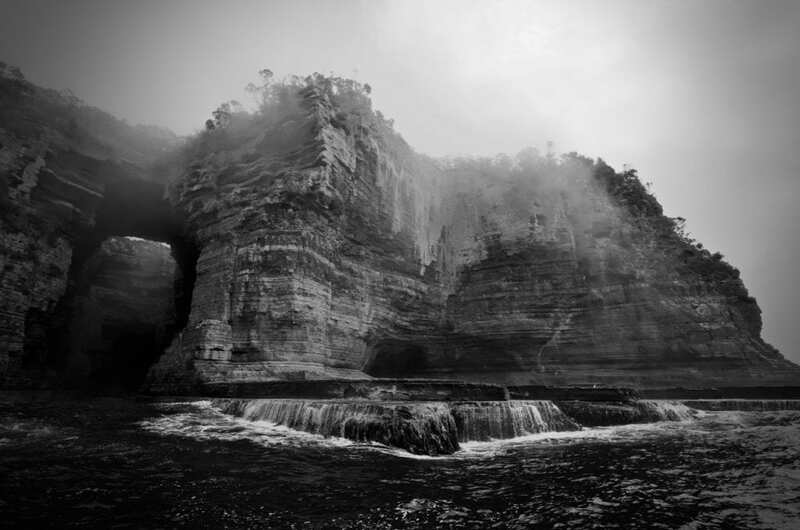 Thick sea fog set a moody scene when we stopped at Tasman’s Arch. 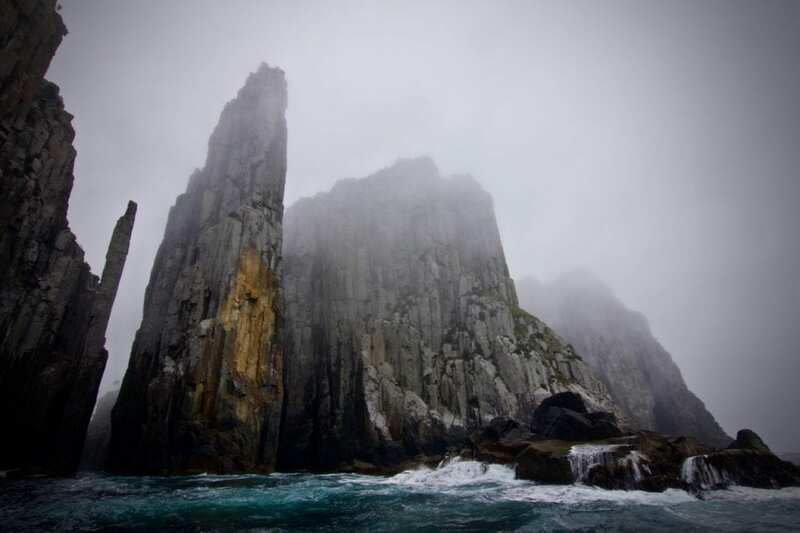 The Candlestick and Totempole at Cape Hauy breaking through the mist. We expected it to be rather tricky to spot much wildlife other than the Seals in those conditions, but we got treated with a visit from a Royal on Thursday. 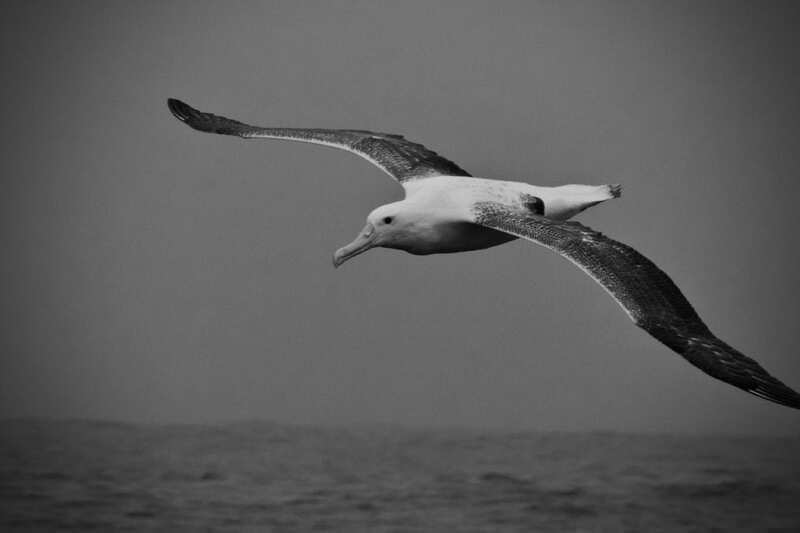 About 1 nautical mile east of o’Hara’s Bluff, a Southern Royal Albatross flew right towards our boat and left everyone on board speechless after seeing its impressive wingspan. Southern Royal Albatross appearing in the sea fog. Beside the Wandering Albatross, the Southern Royal Albatross is one of the two largest species of Albatrosses with an average wingspan of over 3m and an average weight of 8.5kg. These birds are rarely seen in the coastal waters of Tasmania. They mature between the ages of 6 and 12 years old, which is when they form a usually lifelong monogamous bond with a partner with whom they will mate every other year. If they are successful the female will lay one egg which both her and her partner will incubate. When the chick hatches, the parents share the responsibilities of feeding and raising it. They usually like to nest on plateaus, ridges or tussock grassland, with the majority of the Southern Royal Albatross nesting places located on the Subantarctic Campbell Island. Significantly smaller colonies can be found on Auckland Island and Adams Island as well as Enderby Island. Close up photograph of a Southern Royal Albatross showing the distinguishing features. Since Southern Royal Albatrosses are such a rarity in our area we weren’t 100% sure at first if it was truly one of them or a similar looking Northern Royal, or maybe a Wandering Albatross, however upon closer inspection of the photos we could clearly see the characteristic black cutting edge on the pink bill and the clean white leading edge on the wings. 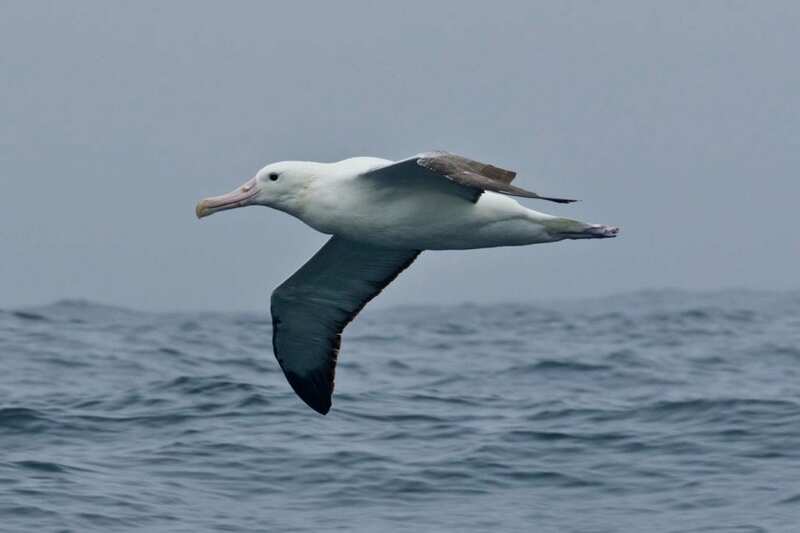 It was also missing the peach coloured neck spot usually seen in Wandering Albatrosses. Getting to see such a rare animal up close reminds us how important it is to protect our Oceans and the creatures living in and around it. Even though the population is recovering after being severely depleted around 1930 (mainly due to the destruction of their nesting places in order to create farmland), human influences like longline fishing and plastic pollution are still major threats to these magnificent animals. If you are traveling to Tasmania this season and would like to learn more about marine conservation and spot some local wildlife, check out our tour options. We would love to share a day on the water with you! Monday was a very emotional day – a day that reminded us and our tour guests of the importance of looking after our Oceans’ health. It was a prime example of the impact that humans have on the marine environment. This entangled Humpback Whale spy-hopped next to our vessel, very likely to show us the rope that was hooked down low in the corner of its mouth. We spotted two Humpback Whales that appeared to be very inquisitive at first. They approached us, spy hopped and rolled over, right next to our vessel. We soon realised that they were literally ‘asking’ for help. One of the whales was entangled in commercial fishing gear. A very long rope of a Lobster / Fish trap had been caught across the mouth of the Whale. We managed to film the slow moving animal with the long rope trailing from its jaw. Watch the clip to the end to see how long that rope was! 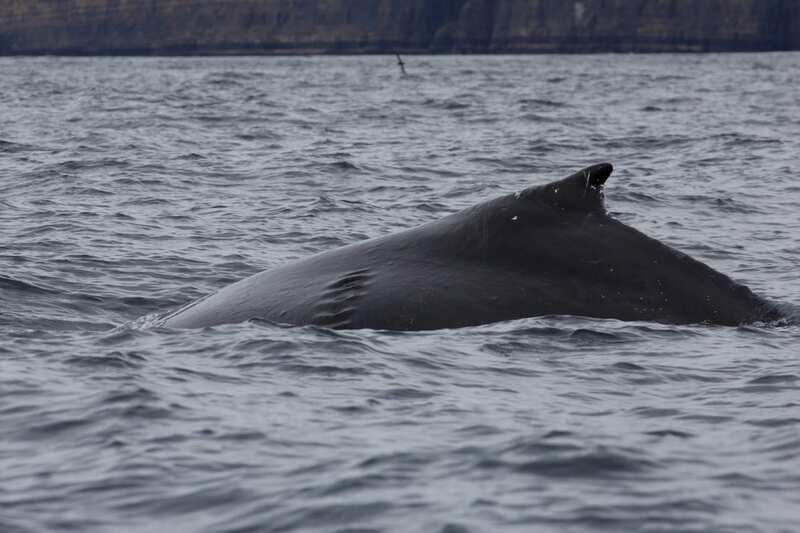 Entangled HumpBack Whale from Wild Ocean Tas on Vimeo. With the Tasmanian Lobster season currently closed, it’s likely that this animal has travel hundreds of kilometres like this. Minimal tail movement is a sure sign that the animal is exhausted. Not only does it restrict feeding ability, but also creates stress and anxiety and possibly a slow and painful death..
We closely collaborate with the crew of the Marine Conservation Program of the Department of Primary Industries, Parks, Water and the Environment in Tasmania (DPIPWE) and called up while we were tracking the two Humpbacks in the hope they can send a vessel and rescue team out to free the entangled whale from the rope. 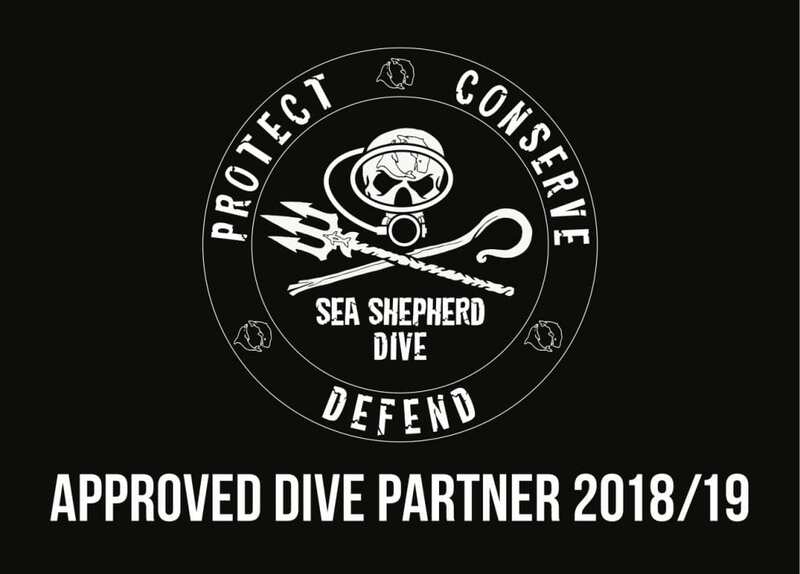 DPIPWE has specialist equipment and staff trained in internationally recognised techniques for undertaking Whale disentanglement operations, but unfortunately they were already further up the coast to look for another entangled Whale near Binalong Bay. As a tour operator we have a public liability to our guests on board and are not permitted to closely approach entangled Whales as they are large powerful animals and present a significant safety risk. It was frustrating that we couldn’t do anything to help. All we could do was to head out the following day without guests on board to search for the entangled Whale, but unfortunately it must have moved on over night. Hopefully it manages to rid itself of this entanglement soon! On the first glimpse, one could think it is a Dolphin, since Dwarf Minke Whales are quite small Whales that reach up to 7 meters in length. The Ocean held a surprise for us when we headed back up the coast after having had a snorkel with the Seals. 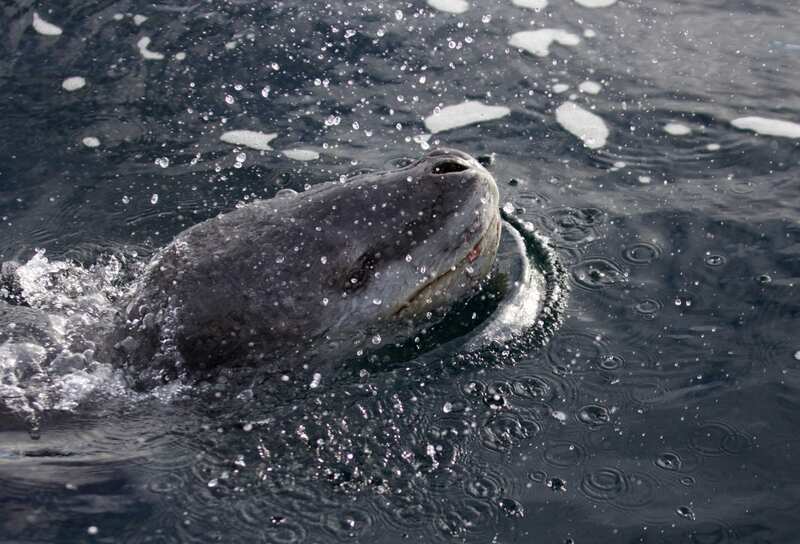 We spotted a single, grey dorsal fin that disappeared quickly. The animal also left a boil on the water surface. It must have been a small whale! So we waited patiently until we saw it pop up again. It turned out being an inquisitive Dwarf Minke Whale. This is the rostrum of the inquisitive Dwarf Minke Whale. The last time we’ve seen a Dwarf Minke Whale on our tour was early December 2017. So it’s been 10 months! They’re super rare to see inshore in Tassie, but a joy to be with. 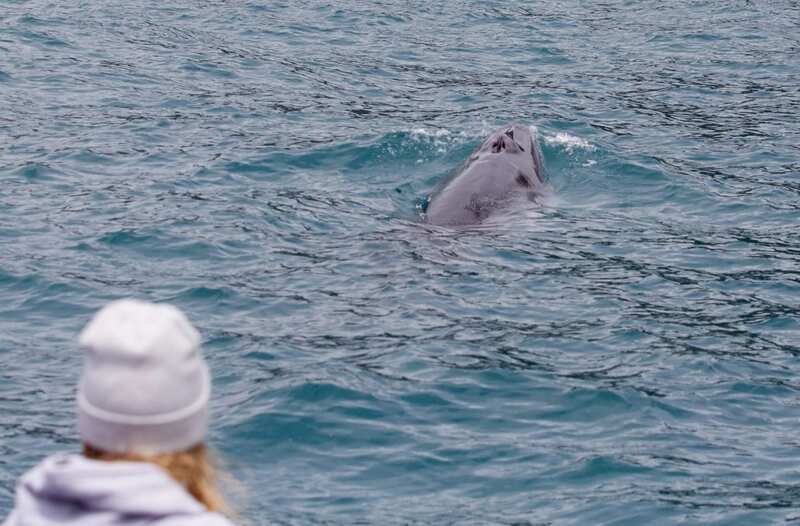 🙂 Like last time we saw one, this Dwarf Minke Whale playfully circled or boat, approached us from the side, swam down and came back up on the other side – a bit like playing hide & seek. If you would like to jump on board and spend a day on the water with us, check out our tour options and book online or call / text us to reserve your seats! A Southern Right Whale Cow carrying her Calf on her back. So yesterday we went whale-watching from land. Well yes, that’s what we do on our days off. 🙂 And it was a great day for it! 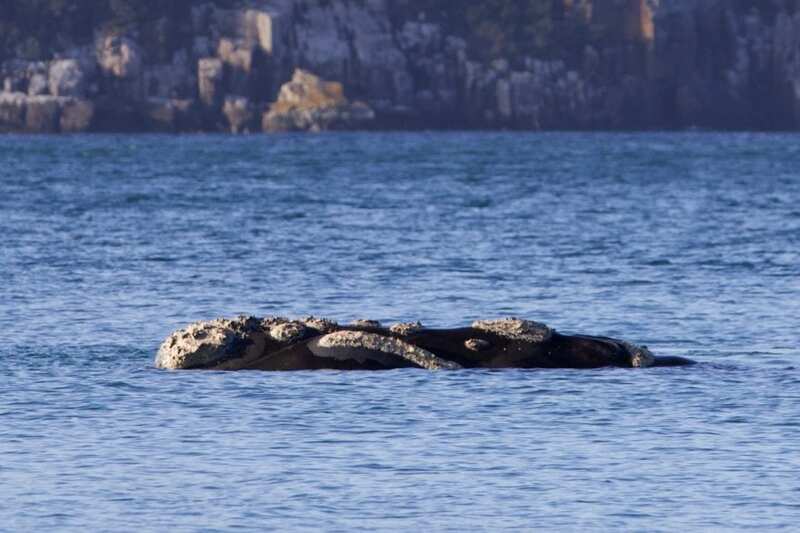 A mother and calf Southern Right Whale were resting inshore in Fortescue Bay on the Tasman Peninsula (only 25 minutes by car from our office) all day, from early morning until dark. Scroll down to see some footage that we captured of the two whales. The little calf was acting a bit cheeky. It rolled over mums back and gave her cuddles. It was amazing to witness such intimate behaviour! 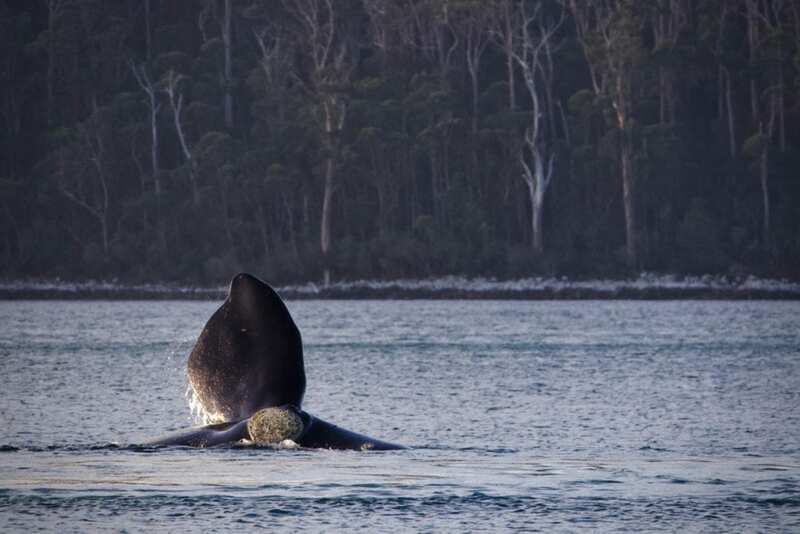 A mother and calf Southern Right Whale resting in Fortescue Bay on the Tasman Peninsula. The Southern Right Whales had been hunted to near extinction in the whaling time (early 1800s). The ban of commercial whaling has helped the species to recover, however, the south-east Australian population is still estimated at around only 600 individuals according to the Department of Primary Industries, Parks, Water and the Environment (DPIPWE). The Southern Right Whale is therefore one of Tasmania’s rarest mammals, and one of the largest, with adults weighing up to 80 tons! To help researchers with the maintenance of a catalogue of unique individuals and the analysis of their behaviour & movement patterns, we try to take as many quality ID shots as possible. Each Southern Right Whale has a unique callosity pattern on the rostrum, chin and lower jaw. Callosities are basically greyish patches of roughened skin that are colonised over time by cyamids (small crustaceans). The little calves are born with these callosities which persist with minor variation through their life and form a great identifying feature. 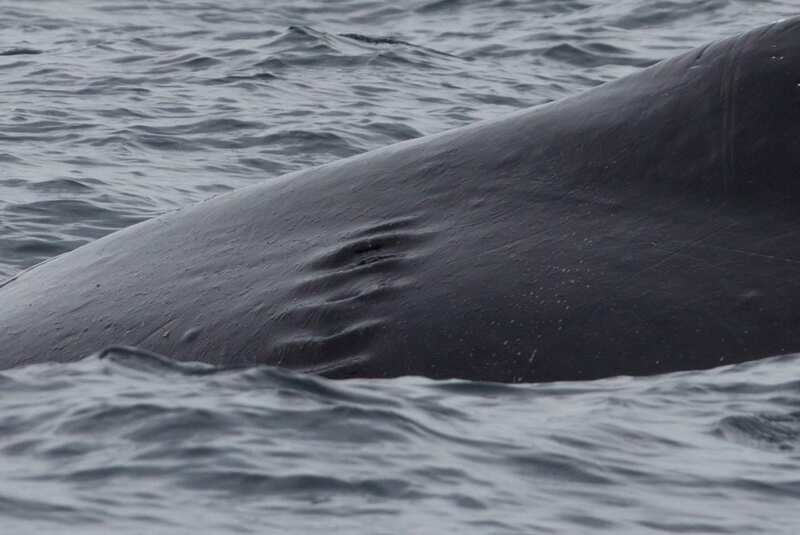 The rostrum of a female Southern Right Whale with its unique callosities. 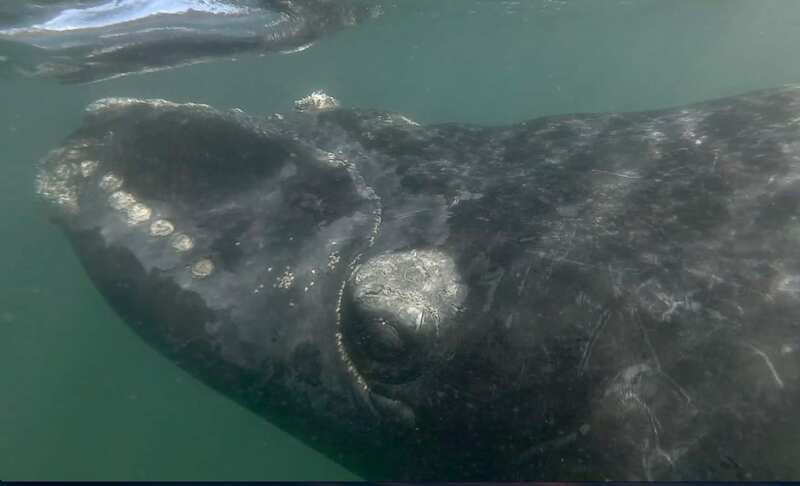 In the photo above, you can clearly see the white callosities on the rostrum of the Southern Right Whale cow. If you’d like to get involved, there are easy things you could do to help with the conservation of these whales! 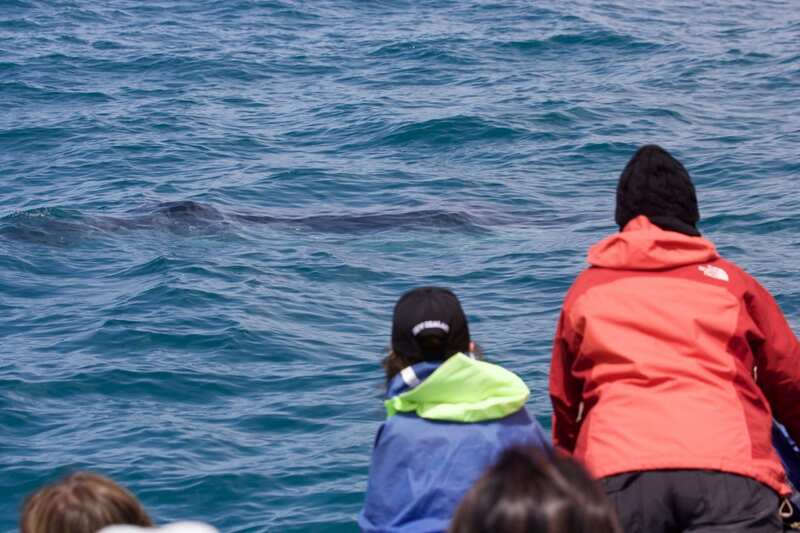 For example, you could ​learn to recognise the Southern Right Whale as a species and report sightings to the crew at Tasmania Parks & Wildlife Service under 0427-WHALES or to us at Wild Ocean Tasmania under 0473-770416. Distinguishing the Southern Right Whale from other Whale species is quite simple. It is the only Whale in its range with a smooth, finless back and the callosities mentioned above. 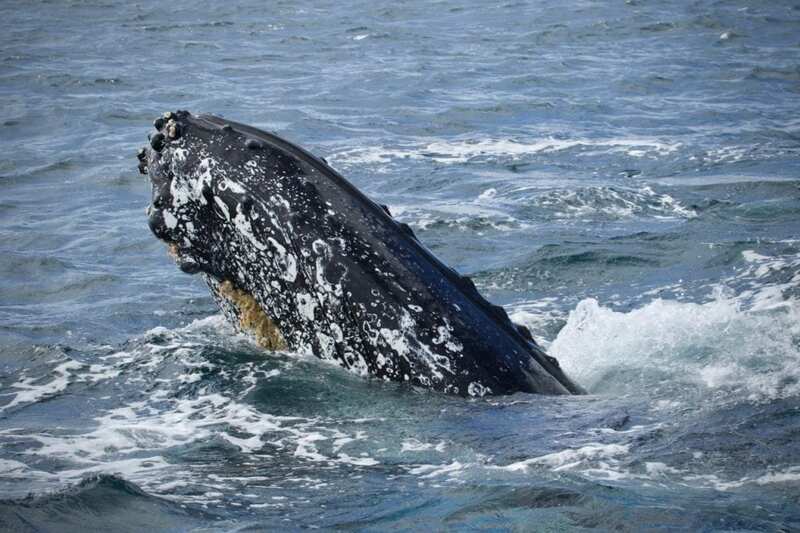 Different to Humpback Whales, these Whales have very broad, paddle-shaped flippers. This photo shows the broad flippers of the Southern Right Whale cow with her calf in the foreground. 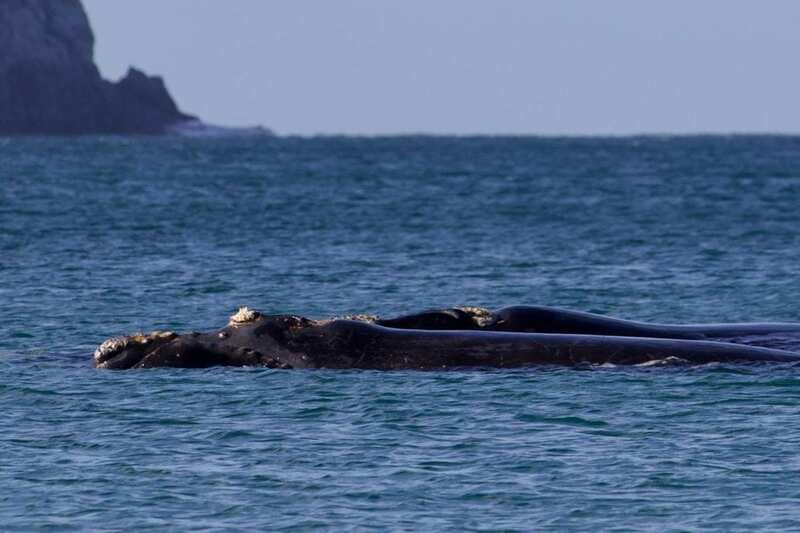 Southern Right Whales are often observed floating quietly in the water with little of their body visible above the surface – a behaviour known as ‘logging’. 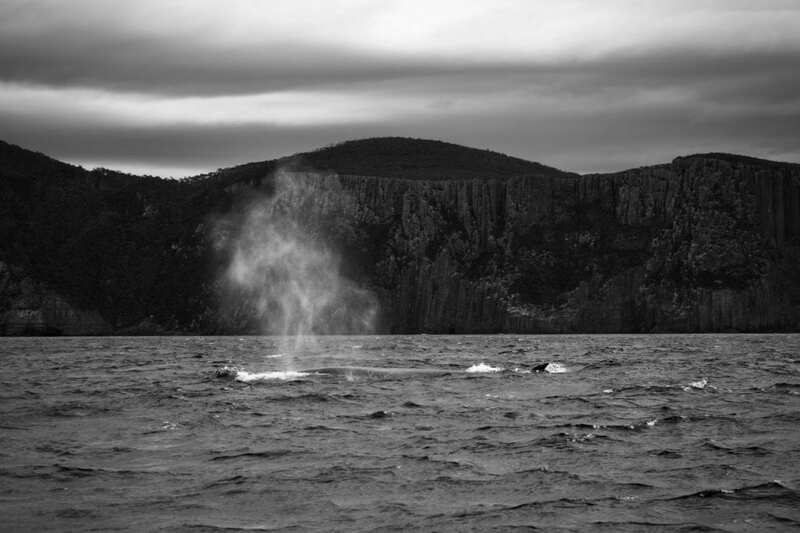 They exhale through two nostril-like blowholes which blow a V-shaped spout of water up to five metres high. Patience is the key when observing Southern Right Whales, as they can easy hold their breath and stay under water for 20 minutes or more. The eye of a baby Southern Right Whale underwater. Here is a short video that shows the mum and her calf cruise along the beach of Fortescue Bay. Watch closely and you can see how the little one is rolling around on mums back at the start of the clip and later in the video it is showing its mum affection by hugging her with its flippers. It’s hard to put it into words how special it was to observe the interaction between mother and calf! The best wildlife encounter for us this season was to watch a Leopard Seal hunt down a Black-faced Cormorant. Now that the busy holiday season has come to an end, we took some time to reflect on all the wildlife interactions we’ve had. The whale migration between October and December has been amazing (as always) and this year we were privileged to spend some time with a very inquisitive Dwarf Minke Whale and the endangered Blue Whale as well. But the most exciting day for us was, when we watched a rare visitor from the Antarctic – a Leopard Seal – prey on a Black-faced Cormorant. Warning: the following photos show a Leopard Seal hunt down and feed on a Black-faced Cormorant! Leopard seals breed on the Antarctic pack ice and range from the Antarctic coast to the sub-antarctic and sub-tropical seas. 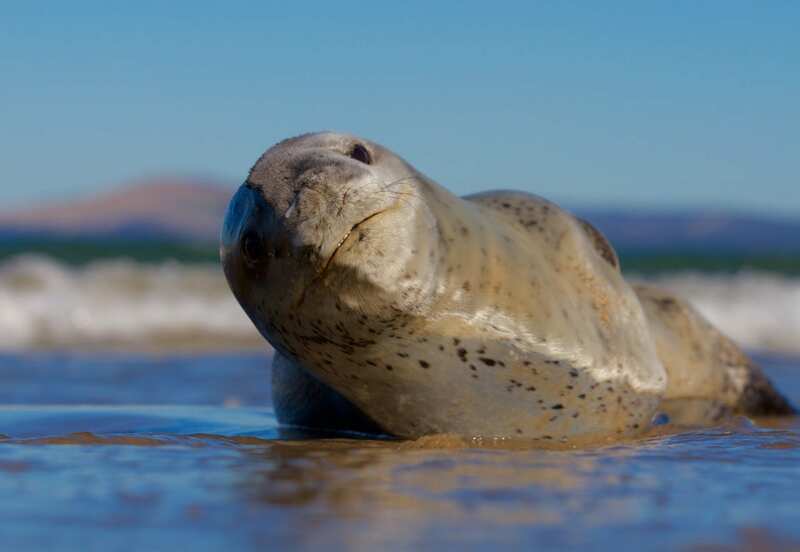 An average of five Leopard Seals visit the coast of Tasmania each year according to DPIPWE (Department of Primary Industries, Parks, water and Environment). This season, more than 10 sightings have been recorded in Tasmania, including at Seven Mile Beach (South of Hobart), Denmans Cove, Pirates Bay, Safety Cove Beach and our encounter at Cape Hauy (all on the Tasman Peninsula). Tasmanian marine biologists explain that these seals are typically sub-adults, not quite ready to breed, that like to explore their range and travel a lot further than the adults generally would do. The Leopard Seal is one of the apex predators in the Ocean and is rarely preyed upon by other animals, except the occasional desperate Shark or Killer Whale. Leopard Seals have powerful jaws and long jagged teeth that they also use for straining krill out of the water. Leopard Seals have a varied diet. 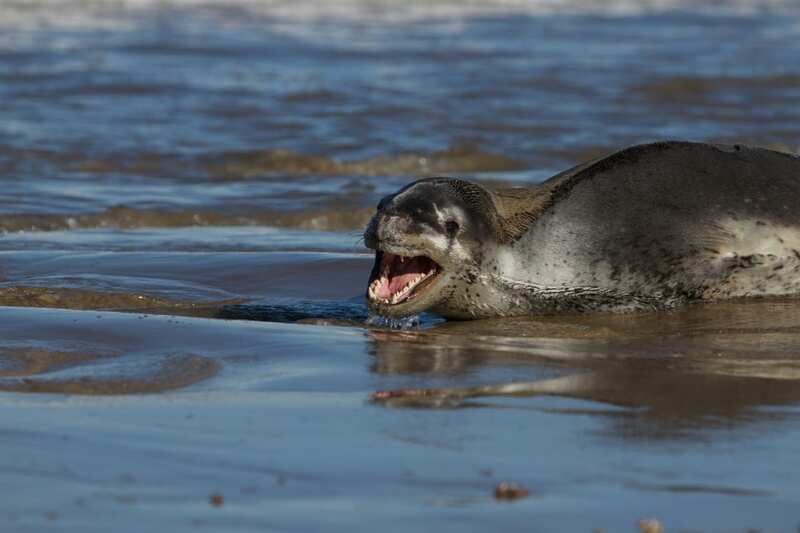 ‘Scats’ or faeces have been collected from Leopard Seals that haul out in Tasmania and studies indicate that whilst in Tasmanian waters the Seals are preying upon Shearwaters, Cormorants and Little Penguins, as well as Cephalopods and Fish (DPIPWE). 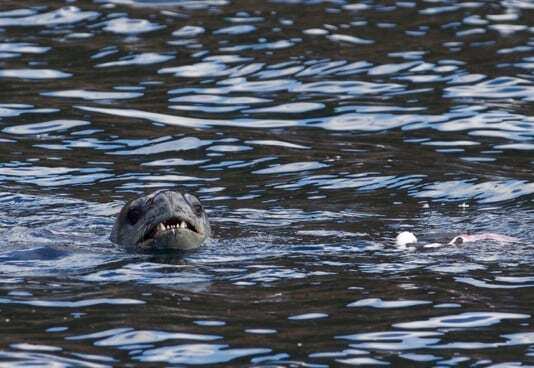 They also use their long, jagged teeth for straining krill and are known to prey on other Seal species, like Crabeater Seals and Weddell Seals. Early on last season, we got to watch this incredible hunter catch and feed on a Black-faced Cormorant. 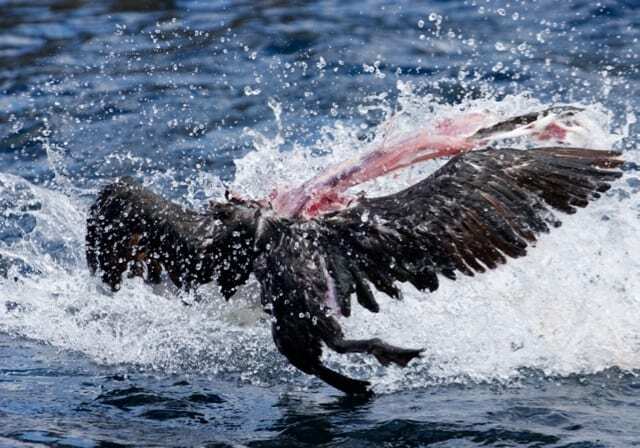 The Leopard Seal was throwing the dead Cormorant around to tear off pieces of meat. 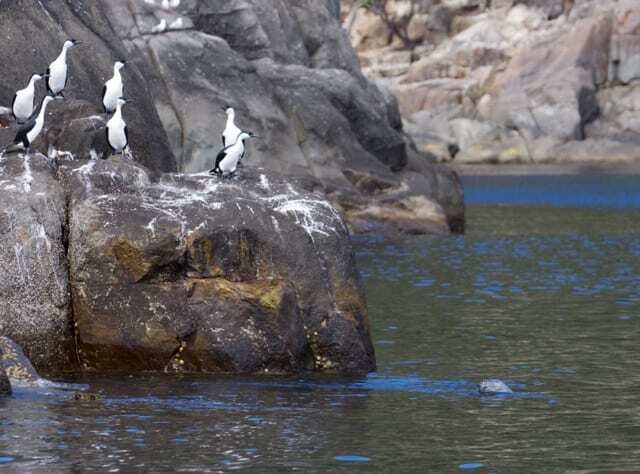 On our tour, we like to stop at one of the rocks the Cormorants choose to rest upon, since they exclusively occur in coastal and marine waters. This time, we saw quite a bit of action before we arrived, with lots of Gulls circling around and calling out loud. And this pour, dead Cormorant got thrown through the air. The leopard Seal popped his head up to see what we were up to and then continued feeding on its meal. 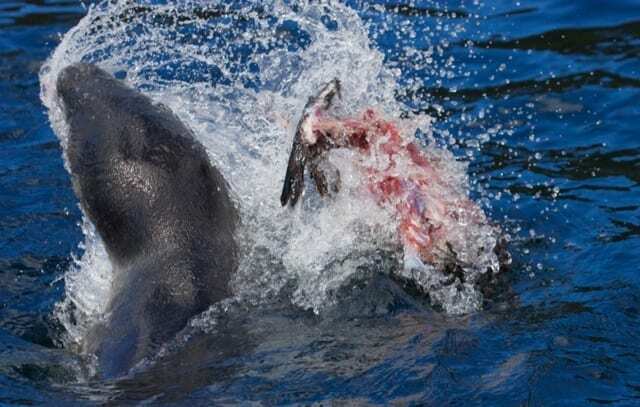 It is common that Leopard Seals thrash the captured bird back and forth until the skin peels away. The remaining carcass is then consumed. Leopard Seal feeding on a Black-Faced Cormorant. Once the Leopard Seal had finished its meal, it actually became quite inquisitive and started to swim pirouettes next to our boat. Then he swam off towards the Cormorant roost in the hope of catching another bird (you can see its head in the bottom right corner of the image below, looking up at the Cormorants). The Cormorants were smarter this time around and so the Leopard Seal had to be content with what he got. After the Leopard Seal had finished its first meal, it swam back to the little Cormorant colony and patrolled around the rocks in the hope for another feed. Would you like to find out more about the different wildlife that we’ve encountered on our tours? Then head over to our Gallery to see our latest snaps. You’re ready to book? Awesome, we’d love to share a day on the water with you! 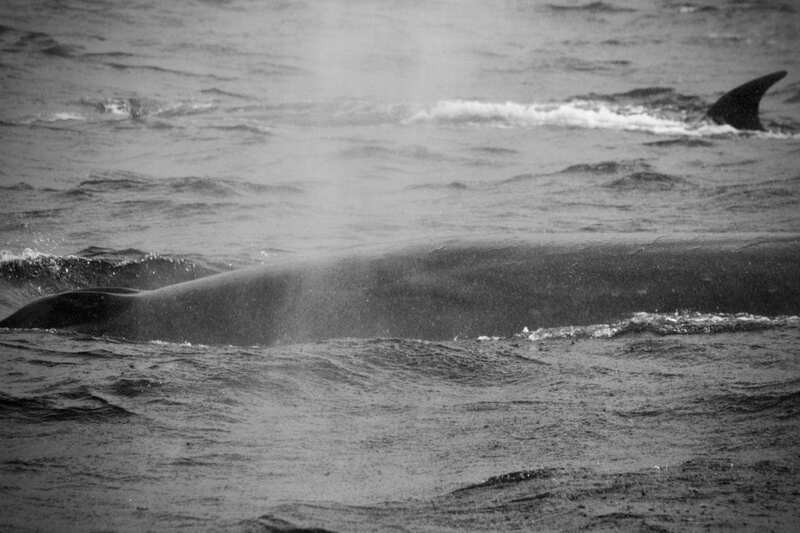 Amazing weekend surprise – A Blue Whale! The large blow of a Blue Whale can reach the height of a three-story building. 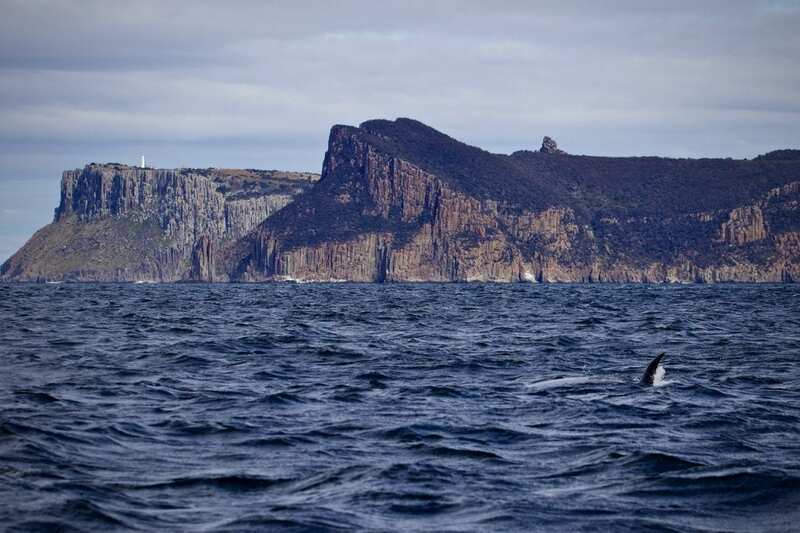 We had our eyes peeled on the weekend cruise, hoping to spot a blow of a Killer Whale, because a few sightings have been reported in Tasmanian waters recently. April seems to be a good time of year to see these incredible predators in Tasmania. Last year we logged 8 sightings in the month of April, as you can see in our blog post ‘April – The Orca month’. Although no Orcas had been spotted, we weren’t disappointed, since we got to spend the whole afternoon with a Blue Whale, one of the world’s rarest species and the largest animal that has ever existed on the planet. Maybe a Pygmy Blue Whale? 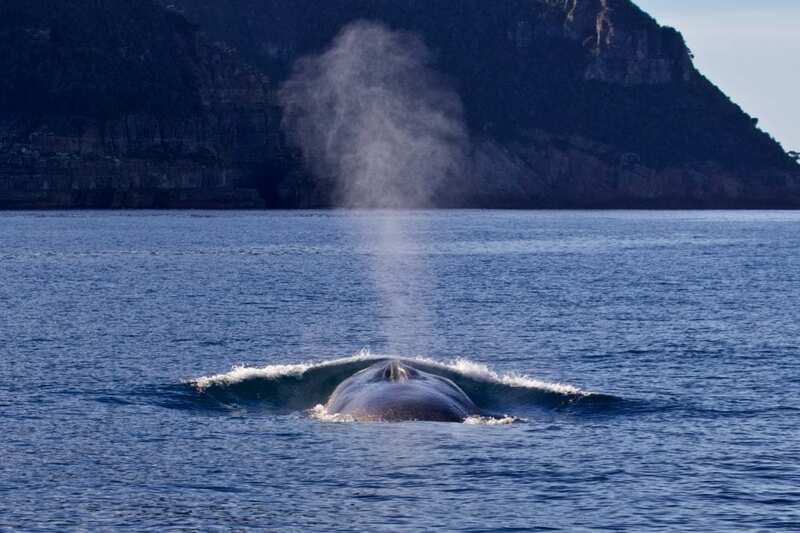 20 meter Pygmy Blue Whale travelling North along the Tasman Peninsula. 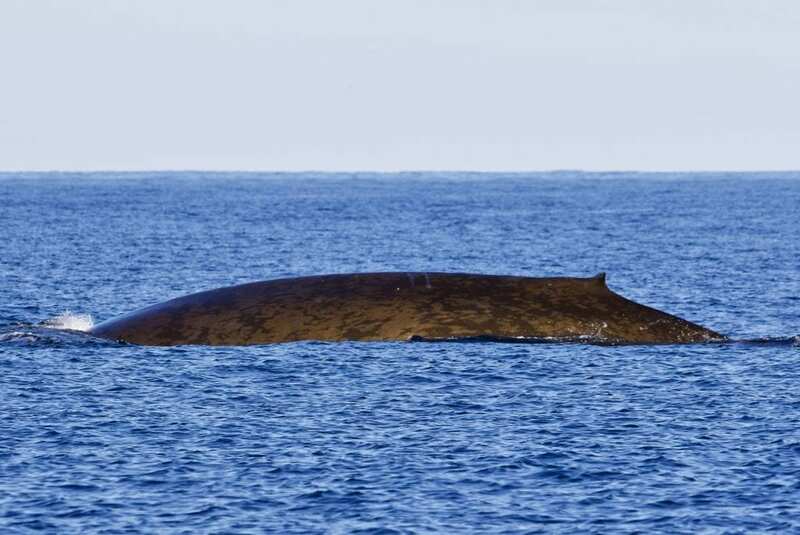 The last time we’d seen Blue Whales was in February 2015, 3 years ago! Back then we watched 2 enormous animals feed on krill. 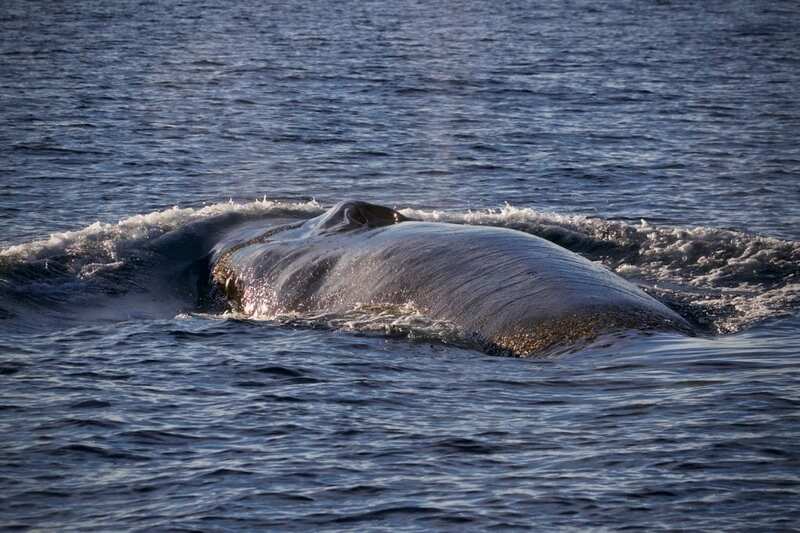 Here you can find some photos of the Blue Whales scooping up food with their huge mouths. This time, we only saw one individual cruising up the coast from Cape Hauy with a constant speed of about 5 knots. This animal appeared to be a bit smaller than the ones we saw in 2015, we estimate a size of approximately 20 meters. We’ve passed on our photos to the Marine Conservation Program Wildlife Management Branch to help with the research of cetaceans on our coastline. 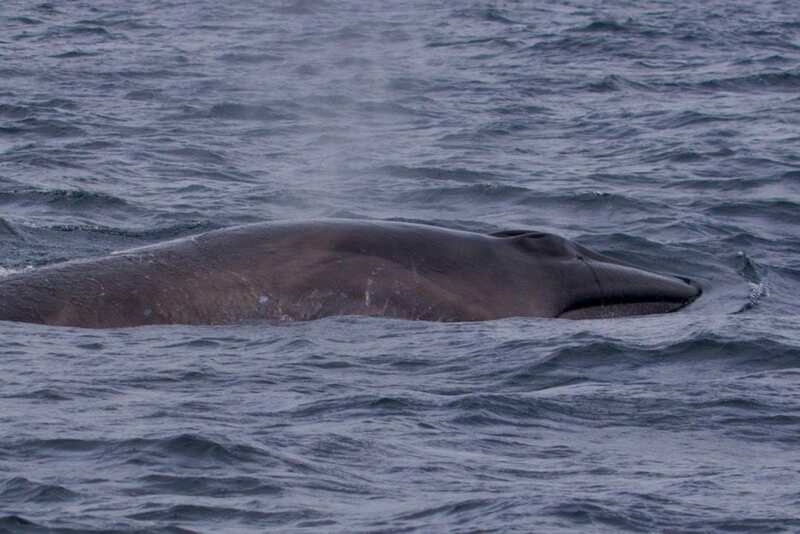 Although Antarctic Blue Whales and Pygmy Blue Whales have a very similar appearance, the researchers are quite confident that it was most likely a Pygmy Blue Whale, as most near-shore TAS Blue Whale IDs have been Pygmy Blue Whales and the apparent size and proportions of the animal are suggestive. Pygmy Blue Whales are typically 15-20m at maturity (up to 30m for an Antarctic form), have a proportionally smaller and rounder rostrum and a shorter/thinner tail stock. The blowhole / nostrils of a Pygmy Blue Whale in Tassie waters. For us it was heartbreaking to watch how some recreational boaters carelessly trolled lures over the Blue Whale on the weekend, chasing Bluefin Tuna. We can’t stress it enough how important it is to act responsibly when sharing the waters with marine mammals or birds. Many marine animals that we encounter here in Tasmania are listed as ‘vulnerable’, ‘threatened’ or ‘endangered’. They have to deal with human caused noise, debris and toxins when navigating the Oceans. 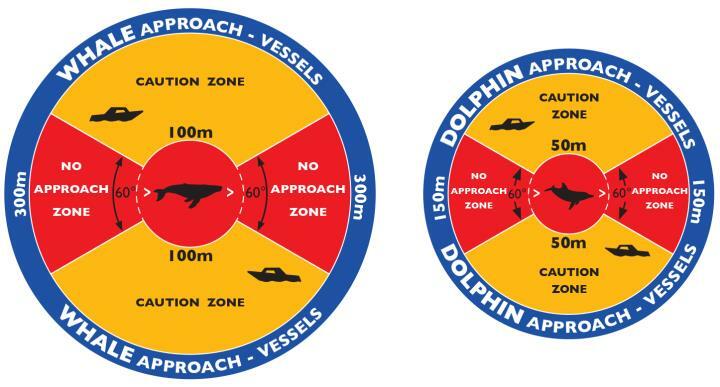 The least we can do is to act responsibly and stick to the guidelines that suggest safe distances to whales and dolphins. If you would like to get onboard to see Tasmania’s marine life and support our conservation efforts, check out our tour options here! The lucky passengers of yesterday’s Seal & Ocean Expedition got to watch a Dwarf Minke Whale – A rare sight on Tasmania’s coastline! 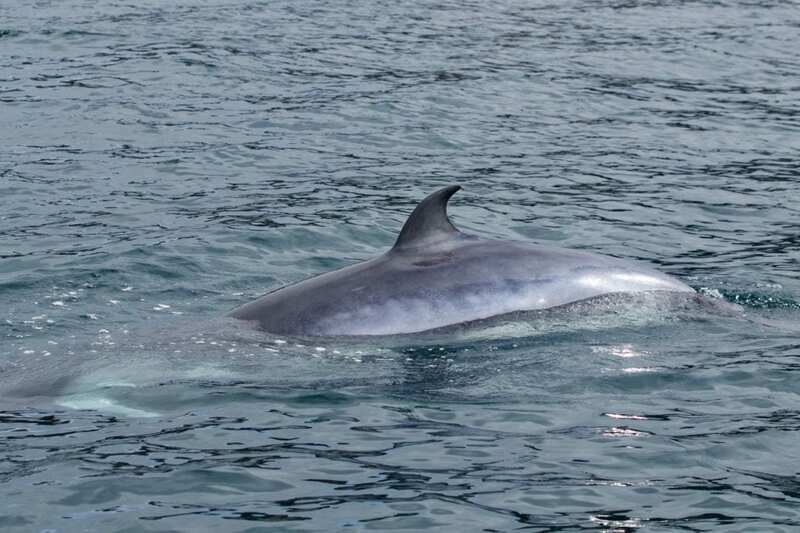 What does a Dwarf Minke Whale actually look like? Most of our crew onboard knew that there was a good chance to spot some Humpback Whales, as they travel past our coastline to their main feeding grounds in Antarctic waters at this time of the year. 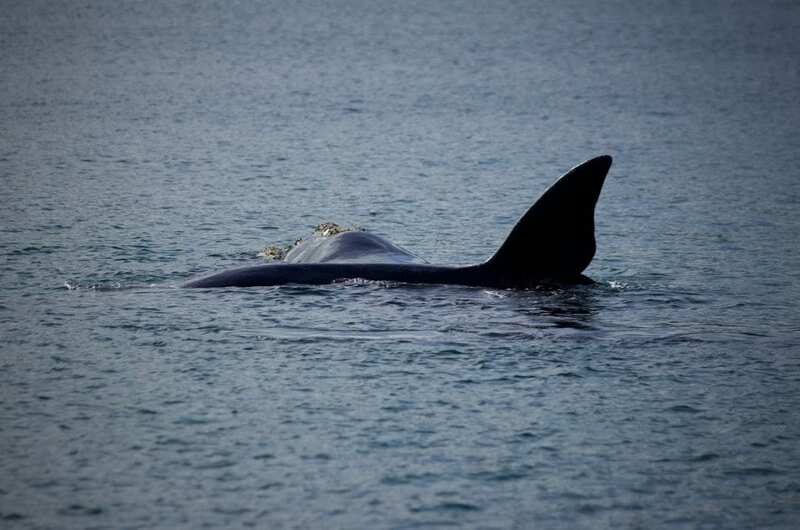 But to see a Dwarf Minke Whale was quite a surprise and nobody really knew what to expect. The Dwarf Minke Whales have a very distinctive white patch on their flippers, unlike the light gray flippers of the Antarctic Minke Whales. 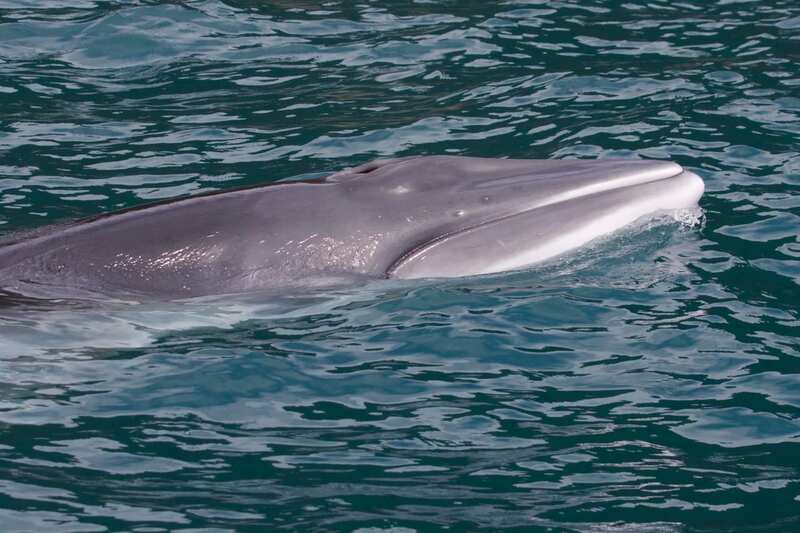 Minke Whales are amongst the smallest of the baleen whales. There are two species of Minke. One is the Common Minke which is restricted to the Northern Hemisphere with a dwarf subspecies occurring in the Southern Hemisphere. The Dwarf Minke reaches up to 7m in length. They were first recognised as a distinct species in the mid 1980s, when they attracted attention in northern Great Barrier Reef waters because they regularly approached close to boats and swimmers. The second is the Antarctic Southern Minke which can grow up to 9m. 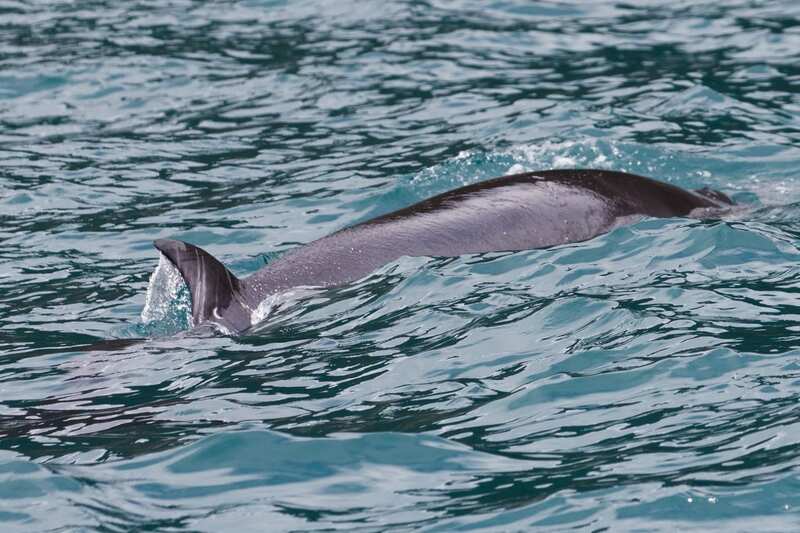 The dorsal fin of Dwarf Minke Whales sits further back on their body compared to a dolphin’s dorsal fin. 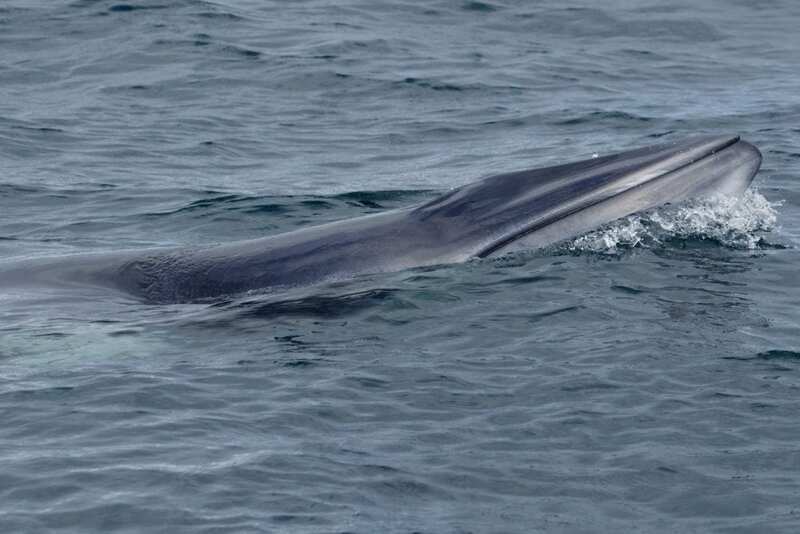 Both the Dwarf Minke Whale and the Antarctic Southern Minke Whale occur in Tasmanian waters, however they are generally seen offshore during their migration North to their breeding grounds or on their return South over spring to early summer. 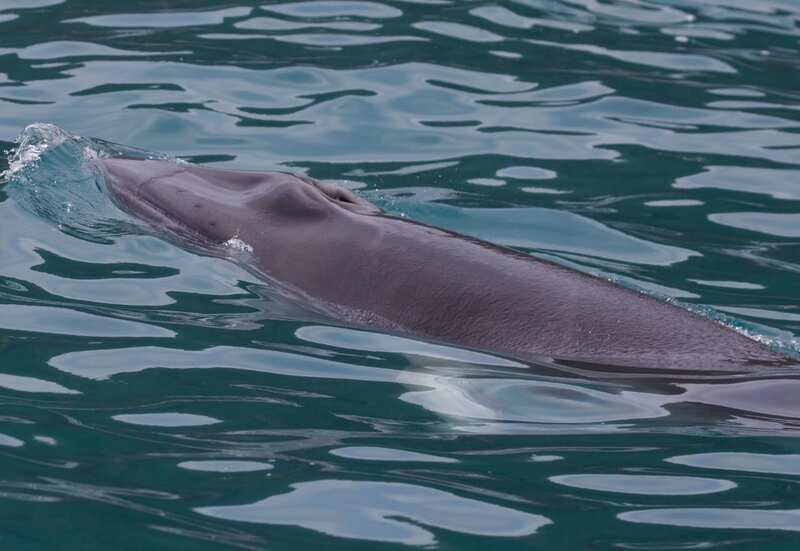 The best identifying features to distinguish the Dwarf Minke Whale from the Antarctic Southern Minke Whale are the smaller size and the white patch on their flippers. The Antarctic species has light grey flippers and the dorsal fin is located far back on their bodies. The Dwarf Minke Whale displayed a very inquisitive behaviour which is common in this species. Whale-watching tour operators and tourists alike love to see the Dwarf Minke Whales in the northern Great Barrier Reef during the winter months, because they are generally very inquisitive. And so was our Dwarf Minke that we saw yesterday. It stayed with us for over half an hour, crossing from left to right under our bow and turned around to approach us from behind. A behaviour similar to that of a dolphin. Our guests certainly got to take lots of photos and great memories home from this encounter! Observing the inquisitive Dwarf Minke Whale. To see how trustingly this wild animal approached us and to observe such an amazing behaviour must encourage people to speak up for these intelligent creatures. Despite the 1986 IWC ban on commercial whaling, some countries refuse to end their whaling operations and use a loophole which allows for scientific whaling. Every year, Japan, Norway and Iceland kill around 1,500 whales between them. 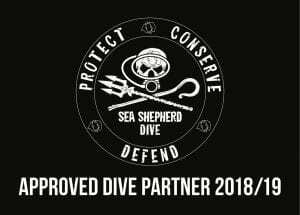 They generally die a slow painful death, as there is no humane way to kill a whale at sea.. Watch this video that was recently released by Sea Shepherd Australia. 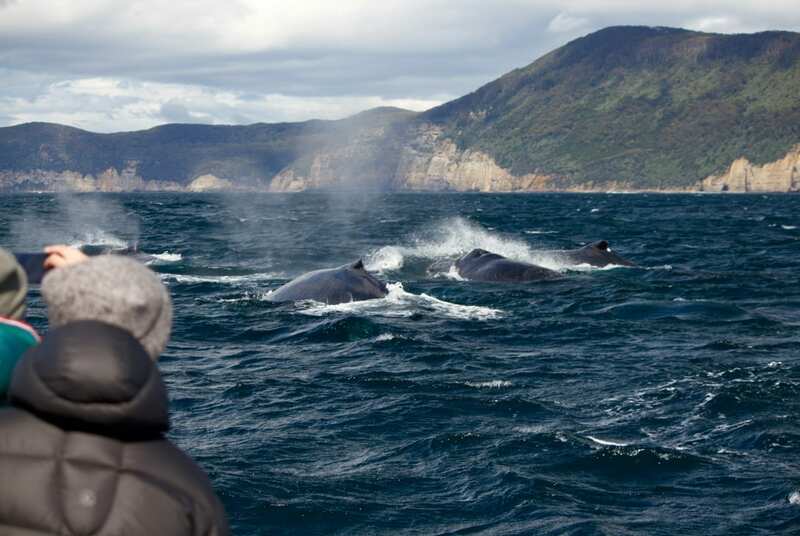 If you would like to learn more about whales in Australian waters and see Tasmania’s rugged coastline, check out our tour options and join us on your next holiday in Tassie!